Arguably the hottest topic in life science, CRISPR continues to make the headlines. Cheap, quick and easy to use, CRISPR has entered labs around the world and is viewed by some as turning everything on its head. To address some of the issues associated with current systems, IDT recently launched a new approach to CRISPR with proven increase in genome editing potency. They tell us that their Alt-RTM CRISPR-Cas9 System provides many benefits to researchers, including improved potency and safety. To learn more about this new system and how it helps researchers, we spoke to Mark Behlke, MD, PhD. Chief Scientific Officer at IDT. 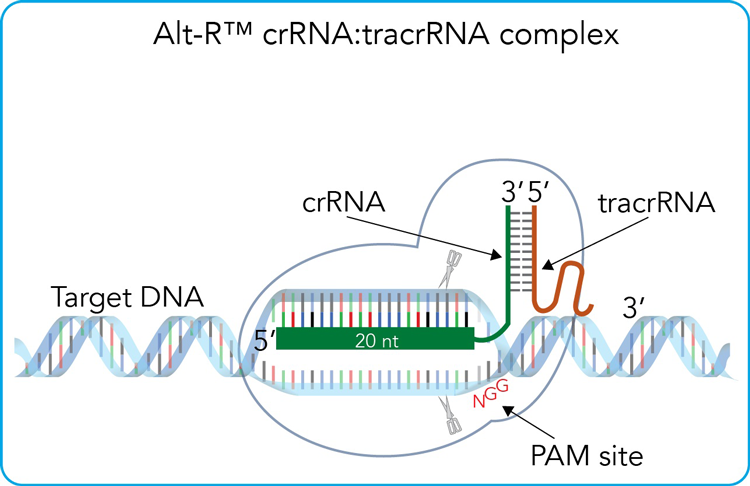 AB: How does IDT's Alt-RTM CRISPR-Cas9 System overcome the problems of chimeric single-guide RNAs (sgRNAs)? Mark Behlke (MB): Single guide RNAs work very well, but have certain limitations. They were designed to make it efficient to obtain a single functional CRISPR guide from an expression vector instead of having to rely upon two separate RNAs being synthesized which then must anneal post-synthesis (much like the situation of shRNA vs. siRNA, when made from an expression vector). The limitations of this system involve the need for either cloning/sequencing of an expression construct or the need to make your own in vitro transcribed (IVT) sgRNAs. IVT sgRNAs work, but require time and labor at the bench. Homemade IVT sgRNAs are difficult to QC, and the investigator has to take it on faith that the transcription products made are good quality. Perhaps more importantly, long IVT sgRNAs are strong triggers of the innate immune system, which can kill some cell types. This is not a problem in plastic adapted cell lines like HeLa or HEK293 cells, but can be a significant issue when primary mammalian cells are studied. The Alt-RTM product employs synthetic RNA oligos, which come ready to use in tubes or plates, meaning that there is now no labor at the lab needed to make or QC the CRISPR guides – they are immediately ready for use, just like PCR primers. Further, IDT has optimized the CRISPR RNA (crRNA) and trans-activating crRNA (tracrRNA) sequences, and carefully added chemical modifications to improve functional activity and limit the risk of triggering immune responses, resulting in healthier cells. AB: What improvements can researchers using your Alt-RTM CRISPR-Cas9 System expect to see? MB: Faster, less labor-intensive experiments, higher editing efficiency, and lower toxicity. AB: Do you believe that CRISPR/Cas9 can continue to benefit from "skillful nudges in the right direction"? Does this approach hold potential for future therapeutic applications? MB: Yes, this is still a very young technology and we should expect continued improvements. Multiple pharmaceutical and biotech companies are already working on therapeutic applications of the CRISPR technology. I fully anticipate that first ex-vivo and later in-vivo methods for medical use will help treat human disease. AB: We recently heard of another CRISPR system with seemingly huge potential, CRISPR/Cpf1. What does this discovery mean for CRISPR/Cas9? The existing Streptococcus pyogenes (Spy) CRISPR/Cas9 system works, and tools are available from multiple sources for researchers to use. The discovery of a new editing platform does not change the fact that the existing Spy Cas9 system works well. Rather, the new system expands the toolbox and adds new possibilities. The most important difference of the Acidaminococcus (As) Cpf1 system is having a “TTTN” PAM sequence vs. the “NGG” PAM sequence from Spy Cas9. This expands the sequence space that can be targeted to include heavily AT-rich genomes, such as Malaria, for example, or enable targeting of AT-rich sites in mammalian genomes. New CRISPR systems will not make the Spy Cas9 obsolete, rather they will increase options available to the researcher. Mark Behlke, MD, PhD was speaking to Ashley Board. Ashley is Managing Editor for Technology Networks.